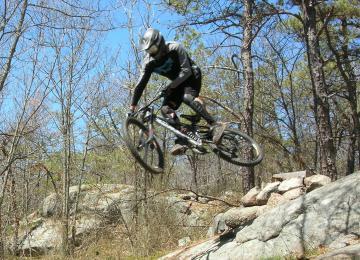 We at Dieselbikes were graced with the privilege to ride this past Saturday (04/29) with Kona pro rider Carlin Dunne. 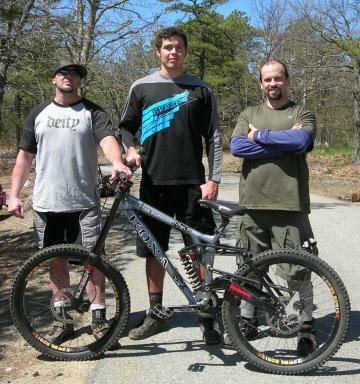 Carlin was visiting the Boston area for the local mountain bike movie awards held by NEMBA. It was a beautiful day for riding and all who attended were stoked to see what bag of tricks Carlin was going to dish out. Carlin arrived at B&T's around 11:00 and to our surprise, brought his downhill rig: a Kona Stab Supreme. We were worried Carlin was not going to enjoy his first ride in B&T's, pushing his 50+ pound bike after just flying in from UTAH the night before. But to our surprise, Carlin ripped up the trails both up hill and of course downhill. "Bruce the Firefighter" led the group ride showing Carlin all the fun spots B&T's has to offer. From the infamous seesaw, the double jumps and barn drop, Carlin was having a blast. There were times we all stopped to rest and Carlin stated that B&T's was a fun place and just getting out with local riders (guys and girls) is something he always looks forward to. Carlin took his time riding, making the most out of his short visit. He was so impressed with the current trail network, he pointed out a few natural elements (which I will need to speak to Bruce about) that he said are potential SICK lines. During our ride we at Dieselbikes were fortunate to have an impromptu interview with Carlin, asking him questions regarding his sponsors, who the best riders (he thinks) are and where is the industry going with the 6" all mountain bike. Carlin is a down to earth guy; he rode with us like as if he was from New England. No one's head was filled with testosterone wanting to try to out due each other just to show off; and Carlin was not self-promoting. Everyone had fun and that is what mountain biking is all about! 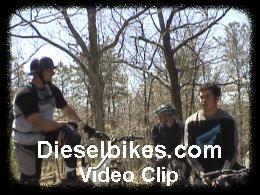 We at Dieselbikes obtained Carlin's permission to use both pictures and video we shot during the ride. Some of this footage you can see on this website, but you will need to wait to see the full-length interview and drops Carlin hit in Dieselbikes 2006 mountain bike movie. I want to personally thank "Bruce the Firefighter" for giving Dieselbikes the opportunity to attend this ride. I also want to thank Carlin Dunne for his professionalism and hope someday soon he will return to ride other New England trails. Who is Carlin Dunne you ask?